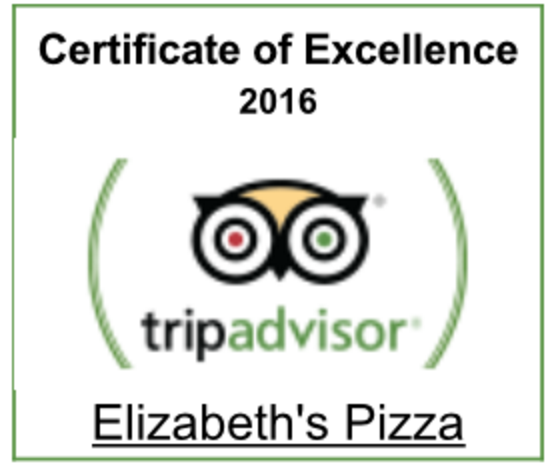 In 2003 the concept of having Elizabeth's Pizza in Pittsboro was conceived. We wanted our restaurant to be a simple and casual place with an interesting menu focusing on the wonderful flavors of the Italian kitchen. We visualized a happy neighborhood establishment with delicious food, ample portions (nobody leaves hungry!) and cheerful knowledgeable servers. The atmosphere would be homey and comfortable; no dress codes and no pretenses! The next few years were spent developing the concept, experimenting with menu ideas in our own home kitchens, and dining in establishments all around . It was agreed that only the best quality and freshest ingredients would be served regardless of price and that most everything would be made to order . The cornerstone of our business would be pizza ! We wanted to offer something for everyone, so we decided to include pasta, fresh seafood, large salads and traditional entrees to accompany Pizza and Other Italian specialties. Elizabeth's has been a true joy for us! Over the years we have had the great fortune of collaborating with a continually wonderful and consistent team, both in the kitchen and dining room. Our staff works with their hearts; they always do their best and inspire us every day! Words cannot express how grateful we are for their continuing commitment to Elizabeth's or how deeply we appreciate the wonderful job they do. We must also extend special thanks to our customers for your loyalty, patience and friendship over the years. You have become more like an extended family to us. Every time someone says: "I feel like I am dining in your home", or "I feel like this is my home" we are gratified in knowing that our original vision has been realized. To make our little place have a big impression in our customers hearts and to be that special place where family and friends meet to eat !and nobody leaves hungry !! This is our true measure of success and we look forward to many more years of "dining" with you!